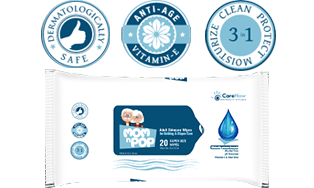 Formulated with skin soothing elements containing Aloe Vera, Vitamin E, Dimethicone, BZK and excipients, Mom n Pop wipes provide rapid bactericidal action while moisturizing and cleaning the skin from dirt and germs. The wipes are made of cellulosic material that provide a smooth application over the skin while avoiding skin tears that can be caused by wiping with a towel. Diaper Rashes and irritation are contained by the presence of anti-microbial and silicon agents that help in removing microbial flora and sealing the pores of skin.